There doesn’t seem to be much that I don’t like about the mini ITX platform. I get everything I want and need and compact platform. Motherboard manufacturers have figured out how to pack all the power, performance, and features into a tiny little package. What isn’t there to like about it? I have used the mini ITX platform for building NAS and compact file servers, but I never really considered using the platform for a gamer or daily use machine. ASRock thinks they can get me to turn to the Dark Side and leave my ATX, bigger is better, roots for their Z97E-ITX/ac motherboard and the ITX platform. Alright, let’s get this out-of-the-way now. Yes, there are some limitations with the platform. First, you only get one PCIe slot. For me, not a big deal. For you, not sure. I only need one big honking video card for my uses though, not two. The platform usually comes with fewer SATA ports than its ATX siblings. Again, I typically run only one SSD and one optical drive (yes, optical), so a ton of SATA ports doesn’t really mean much to me. One other issue is the selection of cases. There really isn’t a large assortment of overly impressive cases out there. Granted, we have been impressed with the ones we have reviewed so far, but that is a drop in the bucket when compared to the options one has when choosing a full-sized ATX case. Premium Alloy Choke The new generation alloy chokes effectively increase up to 90% saturation current and feature a highly magnetic and heat-resistant design, making the motherboard more efficient, stable and reliable. Dual-Stack MOSFET for CPU Power Dual-Stack MOSFET (DSM) is another innovative MOSFETs design by ASRock. The silicon die area is increased by stacking two dies into one MOSFET. The larger the die area, the lower Rds(on). Compared to traditional discrete MOSFET, DSM with larger die area provides extreme lower Rds(on) 1.2 mΩ, so the power supply for the CPU Vcore is more efficient. NexFET MOSFET for Memory Power The next generation NexFET MOSFETs control the power supply to DRAM slots more efficiently. They provide lower RDS(on) 2.9 mΩ, delivering higher efficiency and lower temperature. Nichicon 12K Platinum Caps Supreme 12K platinum capacitors with lifespans of at least 12,000 hours. 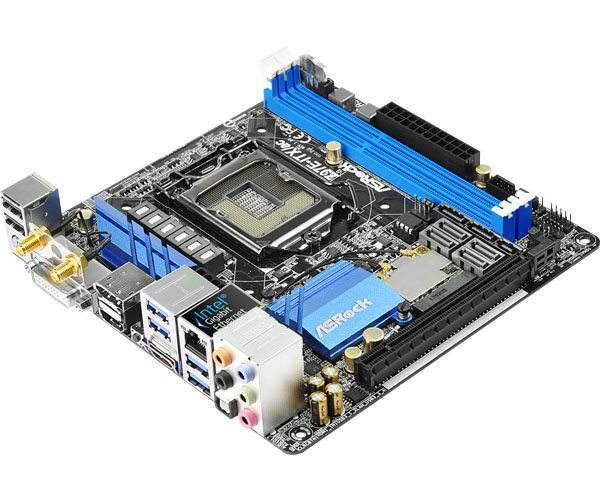 Compared to other counterparts on high-end motherboards that merely have lifespans of around 10,000 hours, ASRock applied Nichicon 12K Platinum Caps that offer 20% longer lifespans and provide more stability and reliability. Sapphire Black PCB ASRock does not overlook any details, even those tiny ones. With pure black PCB appearance, the new Sapphire Black PCB represents rock-solid quality and gives the motherboard a more mysterious touch. 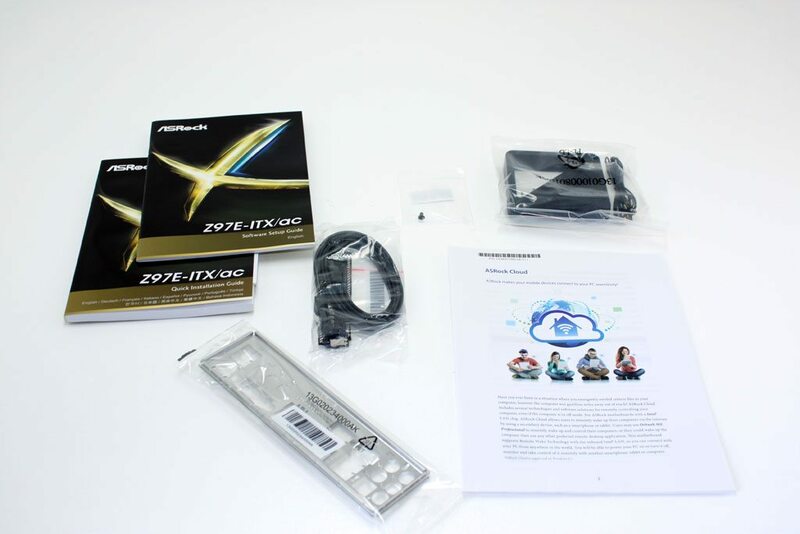 M.2 Socket (PCIe Gen2 x2 & SATA) The onboard M.2 socket is a new interface for connecting Next Generation Form Factor (NGFF) solid state drives or other devices. 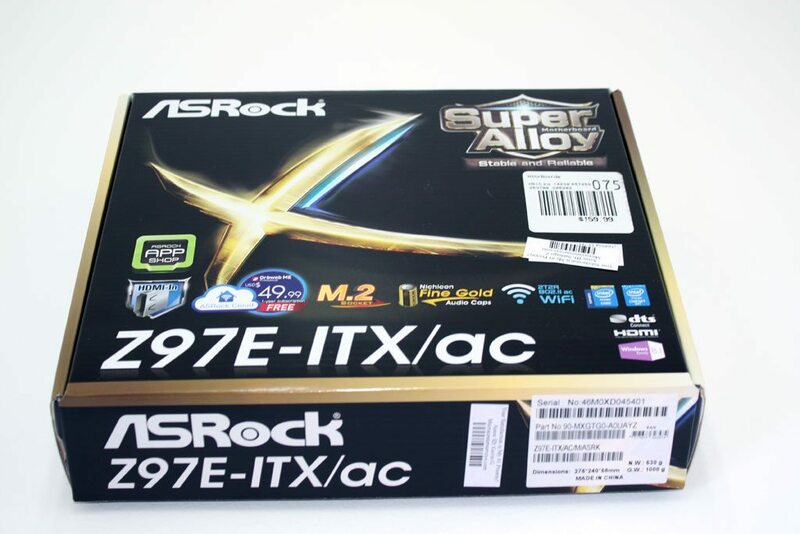 ASRock supports M.2 SATA3 6Gb/s modules and M.2 PCI Express modules up to Gen2 x2 10Gb/s, which is 2X faster compared to other M.2 Gen2 x1 solutions that are limited to 5Gb/s. Nichicon Fine Gold Audio Caps ASRock applied Nichicon Fine Gold Series audio capacitors that every audiophile has been longing for on a PC! Compared with traditional solid caps, the leakage current of Nichicon audio caps is merely 10uA. This is the key to reduce noise level significantly and satisfy even the pickiest audiophiles. 2T2R 802.11ac WiFi No one has time for weak WiFi signals and sluggish internet! That’s why this motherboard comes with an exclusive 2T2R 802.11ac WiFi (2.4G / 5G WiFi) module that supports up to 867Mbps wireless networks and Bluetooth v4.0. Experience up to 289% speed boost compared to your old WiFi! HDMI-In Tired of constantly switching devices to connect to your one and only monitor? From now on just connect the monitor to your motherboard, and connect your secondary device (such as a PS3 or Xbox) to the motherboard’s HDMI-In port. With HDMI-In users may conveniently toggle between the computer’s screen and the secondary device’s screen with a hotkey, or even use their secondary device without powering on the computer. SATA Express Connector The SATA Express* interface provides PCIe Gen2 x2 (10Gb/s) data transfer speed. 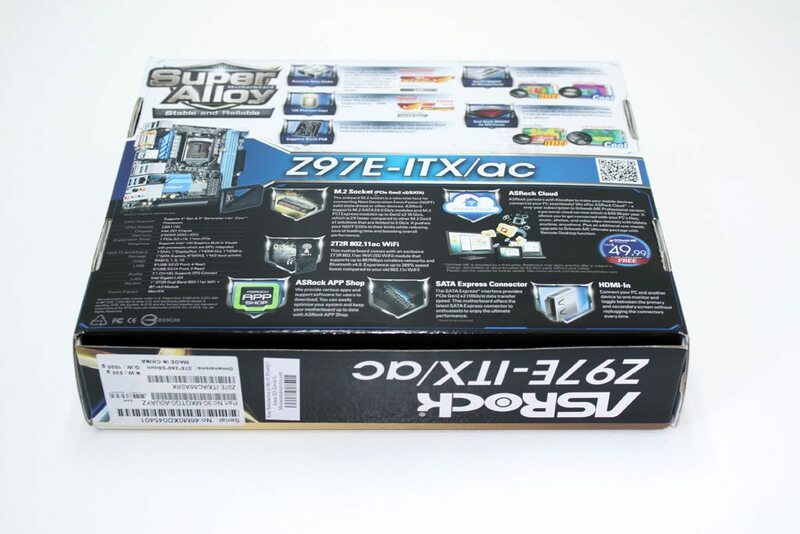 This motherboard offers the latest SATA Express connector to enthusiasts to enjoy the ultimate performance. Digi Power More Precise, More Efficient. Unlike traditional motherboards that use analog power, this motherboard uses a next generation digital PWM (Pulse-Width Modulation) design, which provides CPU Vcore voltage more efficiently and smoothly, so that the stability and lifespan of the motherboard is greatly enhanced. High Density Glass Fabric PCB What you’ve never understood about your computer is that it is scared to death of water, H2O, humidity or whatever you’d like to name it. And even though you do not see the water, actually there may be lots of excessive moist in the air killing your motherboard silently and slowly. No, your motherboard doesn’t melt when in contact with water like the wicked witch of the west, but it dies of short-circuit. Luckily, ASRock has a new High Density Glass Fabric PCB design that reduces the gaps between the PCB layers to protect the motherboard against electrical shorts caused by humidity. That is a ton of marketing on the packaging, far more marketing than goodies in the box. Packaged with the motherboard is just your I/O plate, a few manuals, some SATA cables, WIFI antenna, and a driver CD. 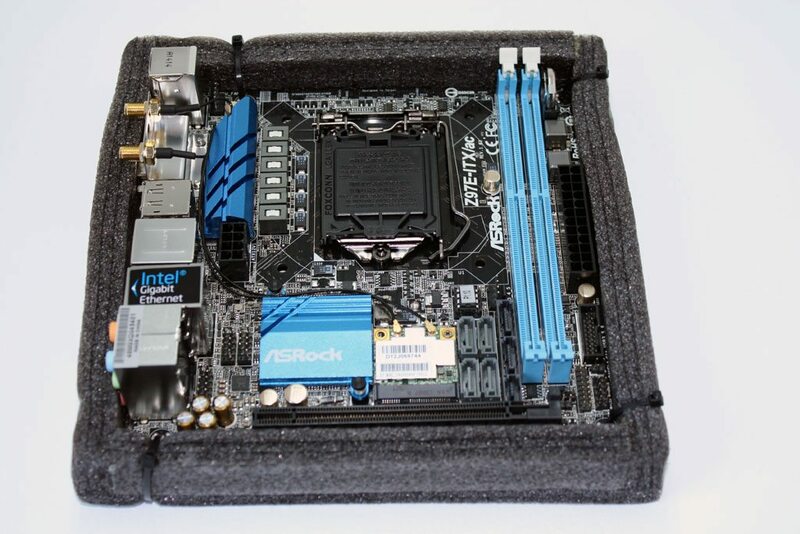 As far as the packaging goes, the motherboard is nestled snugly in foam and zip tied in place.